Now, Voyager takes its time to introduce its big star – Bette Davis as Charlotte Vale – and by means of the delay, the film demonstrates just how clever and accomplished Hollywood’s art of popular storytelling is. Whatever function the delay has within the narrative, it also serves to show off Hollywood’s control of its fictions by offering a veritable commentary on the thrall and seduction that the star possesses. Charlotte is first talked about by others and then she appears as nothing but the image of her ankles waddling tentatively down the stairs. Only eventually is the full face of the actress revealed to us, and even then we’re not given Davis in all her typical vibrant, vivacious splendour but a frumpy and doughy faced version of the woman. The film plays on the connotations of stardom as well as the expectations and emotional needs with which, and for which, we’ve come to such a movie. 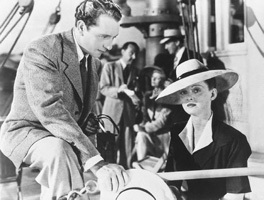 If the nominal story of Now, Voyager is the fictional one in which, in its content world, Charlotte comes to stand up for herself and emerge as the self-possessed woman she always had the potential to become, the film also tells a second, more meta-reflexive one, in which we see a Hollywood film pretending to not deliver the goods only to then ultimately come through on its initial promise and to do so in a glorious fashion. Whatever else it is about, Now, Voyager is also an allegory about Hollywood itself – its sheer magic and aesthetic perfectionism. Predictably, the film has become a cult classic with citations of, or allusions to, its last scene showing up in works as diverse as, for example, Woody Allen’s Play it Again, Sam or Alan Bennett’s recent award-winning play The History Boys. In a famous essay (1), Umberto Eco suggested that one quality of the classic cult film was its quotability (his example was another well-crafted narrative of renounced romance from the same year as Now, Voyager, namely, Casablanca [Michael Curtiz]), and Now, Voyager is indeed rich in memorable nuggets of dialogue, choice moments of conflict and/or interpersonal congruence, and scenes redolent in emotional resonance (who can forget the battle of wits when Charlotte returns to her harridan mother and seems to be put in her place through a well-placed verbal jab only to then triumph over the moment and establish her own will?). This is Classical Hollywood filmmaking at its most consummate, and the seeming perfections of the form work well to override any lingering suspicion that the narrative is more than just a bit improbable (for example, Charlotte is dispatched to the same sanatorium that her lover Jerry’s troubled daughter has been sent to). Charlotte’s victory over her initial awkwardness in life is also the film’s triumph over illogic and the incoherence of its plot. But, even so, the aura of well-craftedness comes at an ideological cost. Now, Voyager may appear to tell its tale with refinement but the cultural implications of its narrative remain curious. Its formal perfection can only be achieved by leaving something imperfect in the life of its protagonist who ends the film with an act of renunciation. So many of the cult classics of Hollywood are ultimately not about the achievement of romance – after all, Rick and Ilsa have to part at the end of Casablanca – but about its being sacrificed in the cause of devotion to a higher mission. Now, Voyager takes the sacrificial structure of 1930s women’s melodramas like Stella Dallas (King Vidor, 1937) – a woman must give up personal happiness for a greater good – and updates it to the new context of the 1940s. While there is no explicit reference to the World War II in the film, the very extent to which romance has to be put on hold and to which Charlotte must renounce amorous pleasure for something deeper, is of a piece with the sacrificial demands placed on women in the period of war necessity. Charlotte’s choices – spinster aunt, vibrant figure of romance, self-abnegating guardian of a young girl – are presented as incompatible and unbreachable, and they split the woman’s identity into pieces relegated to inviolate realms. But in this respect, the film also anticipates the double bind that American women would face in the postwar period. They would be asked to assume responsibility and agency but this meant surrender to value-laden norms about women’s needs, values, functions and basic worth. Not for nothing has Now, Voyager been the ongoing object of several scholarly analyses, including pointedly feminist ones: in the complexity and complication of the positions it holds out for the woman, it presciently resonates with concerns that are still at play in culture today. Umberto Eco, “Casablanca: Cult Movies and Intertextual Collage”, Travels in Hyperreality, trans. William Weaver, Picador, London, 1987, pp. 197-211.